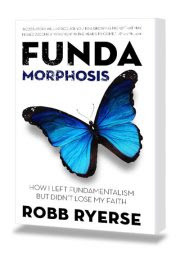 Recently I was asked by Robb Ryerse if I would consider doing a review of his new book, Fundamorphosis. I am glad that I agreed to do this, for I found it a most enjoyable read. I wasn’t far into the book when I asked myself, “Is this man writing my story or his?” The questions he asks and the doctrines he wrestled with were mine too. Furthermore, if they were also mine, then I wondered, to how many others did (or do) they also belong to? Maybe it follows, then, that Fundamorphosis is, in part, the story of all of us who have ever wrestled with fundamentalism. Fundamorphosis is divided into three sections. In the first section Ryerse deals with why he felt he had to leave fundamentalism. He shares of how he began to doubt a lot of the pat theological answers that he received (and gave) and of how he felt bound by tradition. He shares his personal testimony of some of the fears he experienced as he began to push the boundaries by asking those hard questions that nobody wanted asked. One such example was his wrestling with fundamentalism’s view of how right orthodoxy trumps all, versus the good of orthopraxy that he was starting to embrace. He concludes that, while right theology (orthodoxy) is important, it cannot be more important than right behavior (orthopraxy). As he does throughout the book, Ryerse shares personal life stories to illustrate his various points. Ultimately the turning point for him was feeling that he was wasting the best years of his life in a system that he found himself more and more at odds with. In the third and final section of Fundamorphosis we see how the author’s Christian faith has been reconstructed into what it is today. It is about community, it is about story, it is about transformation, and it is about hope. We are introduced to the idea of a more narrative and less systematic form of theology. Instead of the often dry and boringness of systematic theology, we see that “theology is best done through stories,” through your story and through mine. This makes sense when we see this through his previous idea that ultimately we are all theologians. Theology is about articulation in that ultimately it ought to bring about change in the lives of people. Ryerse shows us that theology is so much more than just something to be pulled off a bookshelf now and then; it is to be transformative, and an instrument of change. And finally, theology is about hope. It is about eschatology (the end times) and the realization that God is still very much in control and has a plan through which He will bring all things to completion. It’s about the often-joked “Pan-Millennialism,” which says that all end times stuff will “pan out” just as God has ordained. “No fundamorphosis is ever really complete. This does sound like a good book! Somewhat reflective of many stories of people I know. Thanks for recommending it. I will check it out.